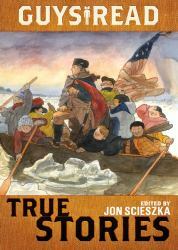 Jon Scieszkas Guys Read anthology series for tweens turns to nonfiction in its fifth volume, True Stories. The fifth installment in the Guys Read Library of Great Reading features ten stories that are 100% amazing, 100% adventurous, 100% unbelievableand 100% true. A star-studded group of award-winning nonfiction authors and journalists provides something for every reader, all aligned with the Common Core State Standards. Compiled and edited by real-life literature legend Jon Scieszka, Guys Read: True Stories is a mind-blowing collection of essays, biographies, how-to guides, and more, all proving that the truth is most definitely out there.Supports the Common Core State Standards.